It’s only 150km long, yet Kangaroo Island is home to arguably the densest and most varied menagerie of wildlife in Australia. It’s landscape is so diverse you won’t believe that all this can be crammed onto one island. Here are nine ways to explore this natural bounty, from wildlife spotting and sand dune sliding to inspiring coastal walks and food so fresh it will almost make you weep. So, jump in your car, discover KI’s natural wonders (words: Steve Madgwick). On Kangaroo Island’s south-western tip, behind the mallee scrub and sugar-gum forests of Flinders Chase National Park, are some extraordinary land formations. Remarkable Rocks are a must-see, particularly for photgraphers; huge oddly-shaped, lichen-covered granite chunks lie incongruently on a rock dome high above the Southern Ocean. Nearby, wander down wooden stairs to Admirals Arch, where you’ll spot a barking New Zealand fur seal or two playing in the waves around ‘the Grotto’, a cave-like formation complete with stalactite-like fossilised roots protruding through the thick rock. Tip: You can easily spend a day exploring Flinders Chase if you’re feeling energetic. Arguably KI’s biggest animal drawcards are its prolific Australian Sea Lion and New Zealand Fur Seal colonies. A close but non-intrusive guided stroll along the beach at Seal Bay Conservation Park (book ahead) is the best bet for a guaranteed close encounter, but will cost you $32 (which contributes to conservation efforts). You might be lucky to spot the seals at other beaches on the south coast and around the rocky outcrops (like the aforementioned Admirals Arch). Wow: Around 7000 New Zealand Fur Seals call KI home in peak season. Inland, off the South Coast Road, in Kelly Hill Conservation Area, explore the island’s most foreign-feeling landscape: the two-square kilometres of dunes known as Little Sahara. Feeling energetic? Tackle the 70-metres-above-sea-level dunes on a sandboard. Nearby: Underneath the conservation area is an impressive network of limestone caves. See Kelly Hill Caves and Conservation Park Visitors Centre. While not native to the island, koalas are thriving here like few places in Australia – you’re way more likely to see our equivalent of the sloth than you are on the mainland. To narrow the odds further, head to the Hanson Bay Wildlife Sanctuary and wander the bear-strewn eucalypts. KI is seriously spoiled for choice for oft-deserted stretches of prime white-sand. Where to start? The north coast is better for swimming with milder water temperatures and fewer rips. Try Snellings Beach and Stokes Bay (wander through the rocks near the café, but keep an eye on the tide). Pennington Bay on the south east coast is one of the more consistent surf breaks. Tip: Note beaches aren’t patrolled. Check out best beaches of KI for more information. Kangaroo Island’s primary producers tend to keep things pure and simple. Case in point, KI honey, sourced from the Ligurian bee, found nowhere else on the planet (in 1885, KI was declared the world’s first bee sanctuary). Check out Clifford’s Honey Farm and Island Pure Sheep Dairy for a taste of what’s on offer. The annual FEASTival (in May) puts all KI produce on the table and in your belly too. Something different: Not edible but there are plenty of natural native scrubs, lotions and balms to be browsed and bought at Emu Ridge eucalyptus distillery. With one-third of KI either a conservation area or national park, you are bound to have plenty of wildlife encounters – drive very, very carefully at night. The island’s ‘standard’ kangaroo is a smaller and darker version of the Western Grey, but there are an equal proliferation of wallabies. You also have a fair chance of coming across echidnas, goannas and even the odd platypus. For the kids: Check out the birds of prey on display at Raptor Domain at Seal Bay. Sadly: Until recently several operators offered nocturnal tours of penguin colonies, but unfortunately the bird’s numbers have been decimated by the thriving New Zealand Fur Seal population so the tours have ceased for now. If easily accessible, short coastal bush walks with sweeping ocean views are your thing then plan more than a couple of days on the island. The Cape du Couedic hike, for example, winds a couple of kilometres along the coast of the Flinders Chase National Park taking in the historic Cape du Couedic Lighthouse (quaint accommodation is available in the heritage keepers’ cottages). Twitchers will love the Murray Lagoon walk around KI’s largest lagoon, with a plethora of waterbirds descending (particularly in winter and spring). 9. Fishing reel you in? 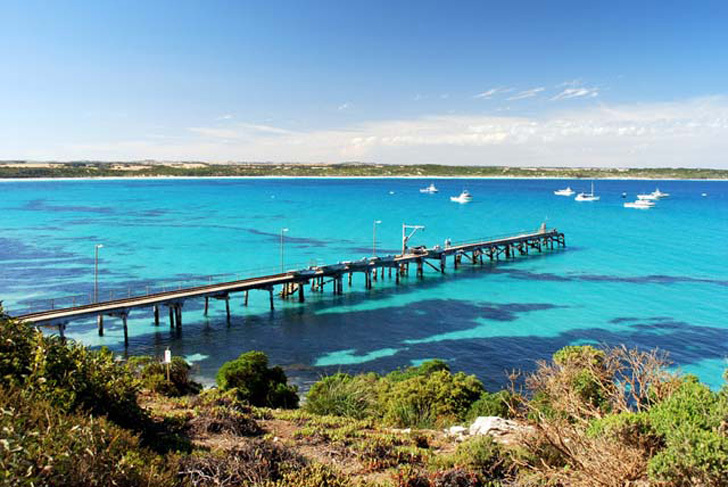 You don’t need to bring your own rod for jetty (Kingscote, Vivonne Bay, Penneshaw) or rock fishing here – hire all you need from the Kangaroo Island Gateway Visitor Information Centre at Penneshaw. For a chance to catch a tuna as big as your children, Kangaroo Island Boat Hire and Kangaroo Island Adventures offers boats for hire and fishing charters.